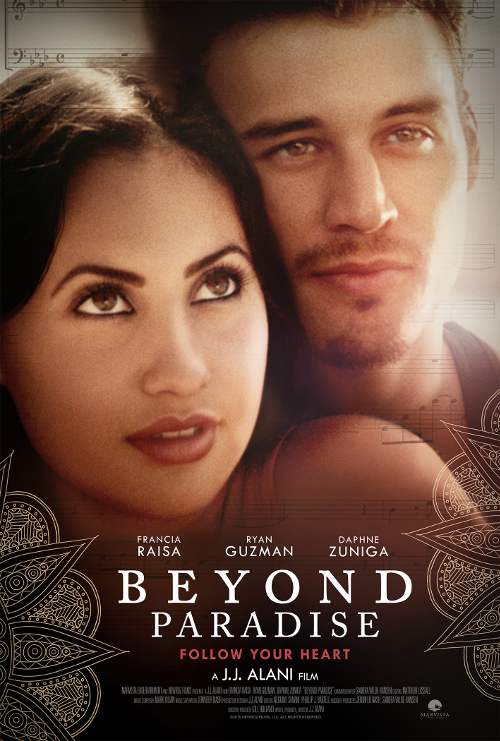 Ryan Guzman (Step Up franchise, The Boy Next Door, “Heroes Reborn”), Francia Raisa (“The Secret Life of the American Teenager”) and Daphne Zuniga (“Melrose Place”, “One Tree Hill”) star in the cross-cultural romance, Beyond Paradise, available on Digital HD and On Demand October 20 from MarVista Digital Entertainment (MVDE). Directed/Produced by J.J. Alani and Executive Produced by Gill Holland, the film also stars Misha Crosby (“The Lying Game”), Max Amini (“Mind of Mencia”), Rome Shadanloo (“A Girl Walks Home Alone…”) and Kira Soltanovich (“Girls Behaving Badly”). Haunted by a tragic past, Shahrzad (Raisa), a talented music student, flees Iran for a semi-arranged marriage in Los Angeles to a man she barely knows. In this new land, she turns to the familiarity of music for comfort and begins piano lessons with the woman next door (Zuniga). However, a passionate and forbidden relationship with Sebastian (Guzman), her piano teacher’s gardener and lover, threatens to destroy all that she has sacrificed to achieve. The romantic drama will be available on Amazon, Google Play, iTunes, Vimeo, VUDU, and Xfinity, as well as On Demand with AT&T, Charter, Comcast, Cox, DirecTV, Time Warner, Verizon and Vubiquity.